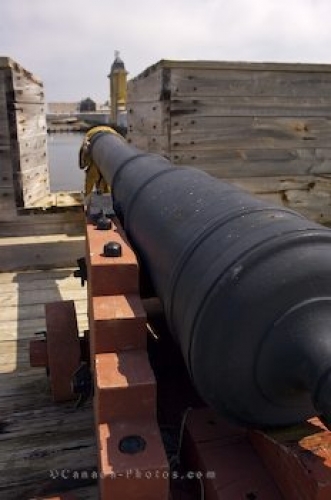 This cannon gun is one of the many attractions at the Fortress of Louisbourg National Historic Site in Cape Breton, Nova Scotia. Set up along the stone wall, this cannon gun protected one of the busiest harbours and one of France's main center of trade and military power in the New World. It was thought that the Fortress of Louisbourg was prepared for any onslaught as the harbour was well defended, it was the defences around the fortress which become the best locations for siege batteries. The first attack on the Fortress of Louisbourg was in 1745 and the cannon guns set up along the stone wall were put into action. The Fortress of Louisbourg is the largest reconstructed 18th century French fortified town throughout North America where visitors can stroll the streets and watch the costumed interpreters relive life in a past century. The cannons along the stone wall, a waterfront tavern, gardens, houses and streets are all part of the $25 million project the government rebuilt in 1961. Picture of a cannon gun set up along the stone wall at the Fortress of Louisbourg, Nova Scotia. Cannon gun along the stone wall near the entrance to the Fortress of Louisbourg National Historic Site, Louisbourg, Fleur de lis Trail, Marconi Trail, Highway 22, Cape Breton, Nova Scotia, Canada.